19.12.2018: The Cobra Sport AmD with AutoAid/RCIB Insurance Racing team will go into its tenth season in the Kwik Fit British Touring Car Championship fully focused on challenging for top honours after confirming its driver line-up for the 2019 campaign. Fife racer Rory Butcher will return for a second season in AmD colours having joined the team at the start of 2018 for what was his first full year of touring car competition. The 31-year-old - who previously raced with success in both single-seater and sportscar competition – enjoyed a stellar debut campaign with the team at the wheel of an MG6 GT, with a best finish of sixth amongst a number of impressive top ten finishes. It meant Rory ended the year in tenth place in the Independents’ Trophy and fourth in the Jack Sears Trophy; only missing out on a top three finish in the latter on a count-back of wins. In a real signal of Cobra Sport AmD with AutoAid/RCIB Insurance Racing’s intent for the season ahead, Rory will be joined in the two-car line-up by Yorkshireman Sam Tordoff who joins the team for what will be his sixth full season in the series. Having finished as series runner-up in 2016, Sam spent a season in GT racing before returning to touring cars this year with Motorbase - taking eleventh in the standings and ending the campaign with the best qualifying average on the grid and a race win at Silverstone. Sam tested with the team twelve months ago and will head into the new season seeking to add to the seven victories and 28 podium finishes he has taken in his career to date. Rory and Sam will make their race debuts in the Hondas when the 2019 season kicks off at Brands Hatch in early April. 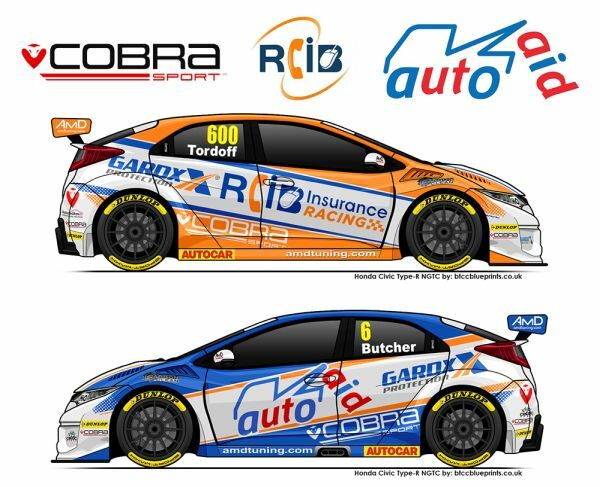 Rory Butcher, #6 Cobra Sport AmD with AutoAid/RCIB Insurance Racing Honda Civic Type R, said: “This year for me was all about gaining experience in the BTCC and learning the ropes after so long racing in GT cars. My aim was to build towards getting into a top package for 2019 to push forwards up the grid, and I’m delighted that I can do that and also stay with Cobra Sport AmD with AutoAid/RCIB Insurance Racing to build on what we achieved this year. I have to thank Shaun, the team and all of my sponsors for making that possible. Sam Tordoff, #600 Cobra Sport AmD with AutoAid/RCIB Insurance Racing Honda Civic Type R, said: “The Honda is a car that I’ve wanted to race for some time and when Gordon Shedden beat me to the title in one, it only increased my desire to see what it was like. To be honest, I didn’t think it was going to happen and it wasn’t something that was on my radar, but then this deal with Cobra Sport AmD with AutoAid/RCIB Insurance Racing came along and I couldn’t be more excited. “I’m sure there will be some people who are surprised by this move and whilst there is some appeal in going into 2019 as an underdog, the reality is that I have one aim and that is to fight for the championship title. I showed strong pace on track in 2018 but things just didn’t go my way and eleventh in the standings wasn’t what I was looking for – and it isn’t what I’m chasing next year. 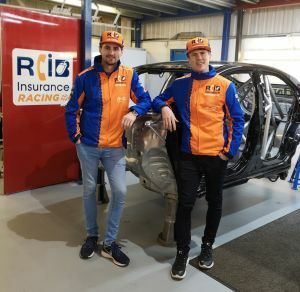 “Cobra Sport AmD with AutoAid/RCIB Insurance Racing have put a lot of investment into not only getting the cars, but in strengthening the team behind the scenes in order to move to the next level and there can be no excuses. The Honda was on pole for the final round of 2018 and won races, so we have to be aiming to do the same from the outset and I’m confident we can raise a few eyebrows when the season gets underway – and will only get stronger as the year goes on. Shaun Hollamby, Cobra Sport AmD with AutoAid/RCIB Insurance Racing joint team principal, said: “From the moment we agreed a deal to purchase the two Hondas, our focus has been on making sure we signed the right drivers who would give us the best chance of success on track in 2019. In Rory and Sam, I’m confident we have found the ideal pairing and we are massively excited about what we can achieve together next season. “We knew when we brought Rory onboard this year that he was a top quality driver and his performances in the MG were outstanding. He fitted in with the team immediately and keeping him for a second season was a priority. Given the fact he now has a year of experience under his belt, I have no doubt at all that Rory will be a real contender for podium finishes and race wins. “To bring in a driver of the calibre of Sam is fantastic for us as a team and we are expecting big things from him at the wheel of the Honda. He brings experience from running with three of BTCC’s top teams and is a proven race winner who has consistently shown himself to be one of the quickest drivers on the grid. He is also well aware of what needs to be done to build a championship challenge, and that has to be his target in 2019. Rachel Abbott, Cobra Sport AmD with AutoAid/RCIB Insurance Racing joint team principal, said: “I’m delighted that we have been able to have secure both Sam and Rory for the 2019 season as we embark on a new challenge with the Hondas. Bobby Thompson returns to Team HARD for 2019 BTCC season. Thompson focused on ‘Forever Forward’ as debut BTCC season ends. Who'll be crowned 2018 BTCC champion: Turkington, Ingram or Chilton?